For the neighborhood of Karachi, see Kiamari. The first evidence of kemari is from 644 AD. The rules were standardized from the 13th century. The game was influenced by the Chinese sport of Cuju. The characters for Kemari are the same as Cuju in Chinese. The sport was introduced to Japan about 600, during the Asuka period. Nowadays, it is played in Shinto shrines for festivals. George H. W. Bush played the game on one of his presidential visits to Japan. It is a non-competitive sport. The object of Kemari is to keep one ball in the air, with all players cooperating to do so. Players may use any body part with the exception of arms and hands – their head, feet, knees, back, and depending on the rules, elbows to keep the ball aloft. The ball, known as a mari, is made of deerskin with the hair facing inside and the hide on the outside. The ball is stuffed with barley grains to give it shape. When the hide has set in this shape, the grains are removed from the ball, and it is then sewn together using the skin of a horse. The one who kicks the ball is called a mariashi. A good mariashi makes it easy for the receiver to control the mari, and serves it with a soft touch to make it easy to keep the mari in the air. 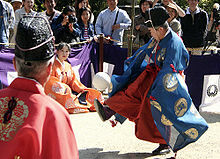 Kemari is played on a flat ground, about 6–7 meters squared. The uniforms that the players wear are reminiscent of the clothes of the Asuka age and include a crow hat. This type of clothing was called kariginu and it was fashionable at that time. ^ a b c Allen Guttmann, Lee Austin Thompson (2001). Japanese sports: a history. University of Hawaii Press. pp. 26–27. ISBN 9780824824648. Retrieved 2010-07-08. ^ a b c Witzig, Richard (2006). The Global Art of Soccer. CusiBoy Publishing. p. 5. ISBN 9780977668809. Retrieved 2010-07-08. ^ Wines, Michael (1992-01-07). "On Japan Leg of Journey, Bush's Stakes Are High". The New York Times. ^ Wines, Michael (1992-01-08). "Japanese Visit, on the Surface: Jovial Bush, Friendly Crowds". The New York Times. Wikimedia Commons has media related to Kemari.